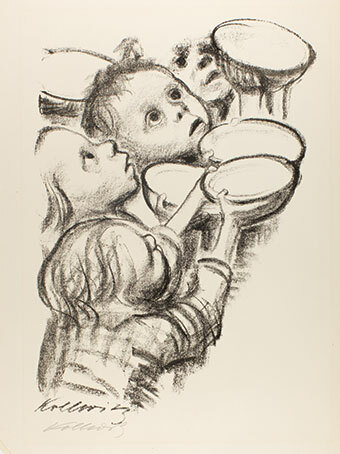 Käthe Kollwitz (German, 1867-1945), Deutschlands Kinder hungern! (Germany’s Children are Starving! ), 1924, lithograph on cream wove paper, The Vivian and Gordon Gilkey Graphic Arts Collection. As one of humanity’s fundamental needs, food is a constant across cultures and centuries. More than just daily sustenance, food is also a social lubricant, a focal point for celebrations, a bearer of cultural meaning, and a sensual delight. Its scarcity causes wars, its production ignites debate, and its sale and distribution have spawned complex networks of industry and advertising. Artists have depicted food and its role in society throughout history, from prehistoric cave paintings depicting wild game to lavish still lifes documenting the bounty and wealth of an urban society. Feast and Famine focuses on art since 1850 to question how artists use the topic of food and drink as a means to explore society, examine ritual, and advocate politically. This exhibition of more than 60 prints and multiples investigates modern food and the culture of eating through a variety of images—from sensual still lifes to enticing advertising posters, from playful Pop Art to political broadsides. Featured artists include the Pre-Impressionist Jean-François Millet, German Expressionists Käthe Kollwitz and George Grosz, and the Pop Art masters Roy Lichtenstein and Andy Warhol. In addition, the exhibition showcases a special selection of rare artist-designed menus by Henri de Toulouse-Lautrec, James Ensor, and David Hockney. Drawn from the Museum collection and enhanced by important loans from local collections, Feast and Famine celebrates the interplay between food and art, pleasure, and politics. The exhibition is supported in part by the Vivian and Gordon Gilkey Endowment for Graphic Arts.